Politics of Liberia takes place in a framework of a presidential representative democratic republic modeled on the government of the United States, whereby the President is the head of state and head of government; unlike the United States, however, Liberia is a unitary state as opposed to a federation and has a pluriform multi-party system rather than the two-party system that characterizes US politics. Executive power is exercised by the government. Legislative power is vested in both the government and the two chambers of the legislature. Liberia is still in transition from dictatorship and civil war to democracy. Liberia's government is based on the American model of a republic with three equal branches of government, though in reality the President of Liberia has usually been the dominant force in Liberian politics. 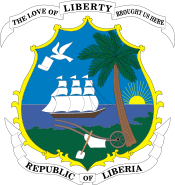 Following the dissolution of the Republican Party in 1876, the True Whig Party dominated the Liberian government until the 1980 coup, eventually creating what was effectively a one-party state. Currently, no party has majority control of the legislature. The longest serving president in Liberian history was William Tubman, serving from 1944 until his death in 1971. The shortest term was held by James Skivring Smith, who was interim president for all of two months. However, the political process from Liberia's founding in 1847, despite widespread corruption, was very stable until the end of the First Republic in 1980. The Economist Intelligence Unit rated Liberia as "hybrid regime" in 2018. The Executive Mansion has been the home of Liberian Presidents since its construction in 1964. It has not been used since a fire in 2006. Between 1980 and 2006, Liberia was governed by a series of military and transitional governments. The president of the last of these, Charles Taylor, was forced to step down in 2003, and the United Nations installed a transitional government. Elections to select a government to replace the transitional government took place in October and November 2005. (see 2005 Liberian general election). In the 1980s, Samuel K. Doe's government increasingly adopted an ethnic outlook as members of his Krahn ethnic group soon dominated political and military life in Liberia. This caused a heightened level of ethnic tension leading to frequent hostilities between the politically and militarily dominant Krahns and other ethnic groups in the country. Political parties remained banned until 1984. Elections were held on 15 October 1985 in which Doe's National Democratic Party of Liberia (NDPL) was declared winner. The elections were characterized by widespread fraud and rigging. The period after the elections saw increased human rights abuses, corruption, and ethnic tensions. The standard of living, which had been rising in the 1970s, declined drastically. On 12 November 1985, former Army Commanding General Thomas Quiwonkpa invaded Liberia by way of neighboring Sierra Leone and almost succeeded in toppling the government of Samuel Doe. Members of the Krahn-dominated Armed Forces of Liberia repelled Quiwonkpa's attack and executed him in Monrovia. On 24 December 1989, a small band of rebels led by Doe's former procurement chief, Charles Taylor invaded Liberia from Ivory Coast. Taylor and his National Patriotic Front rebels rapidly gained the support of Liberians because of the repressive nature of Samuel Doe and his government. Barely six months after the rebels first attacked, they had reached the outskirts of Monrovia. The First and Second Liberian Civil War, which was one of Africa's bloodiest, claimed the lives of more than 200,000 Liberians and further displaced a million others into refugee camps in neighboring countries. The Economic Community of West African States (ECOWAS) intervened and succeeded in preventing Charles Taylor from capturing Monrovia. Prince Johnson who had been a member of Taylor's National Patriotic Front of Liberia (NPFL) but broke away because of policy differences, formed the Independent National Patriotic Front of Liberia (INPFL). Johnson's forces captured and killed Doe on 9 September 1990. An Interim Government of National Unity (IGNU) was formed in Gambia under the auspices of ECOWAS in October 1990 and Dr. Amos Sawyer became President. Taylor refused to work with the interim government and continued war. By 1992, several warring factions had emerged in the Liberian civil war, all of which were absorbed in the new transitional government. After several peace accords and declining military power, Taylor finally agreed to the formation of a five-man transitional government. After considerable progress in negotiations conducted by the United States, United Nations, Organization of African Unity, and the Economic Community of West African States, disarmament and demobilization of warring factions were hastily carried out and special elections were held on 19 July 1997 with Charles Taylor and his National Patriotic Party emerging victorious. Taylor won the election by a large majority, primarily because Liberians feared a return to war had Taylor lost. Unrest continued, and by 2003, two rebel groups were challenging Taylor's control of the country. In August 2003, Taylor resigned and fled the country and vice-president Moses Blah became acting president. On August 18, 2003 the warring parties signed the Accra Comprehensive Peace Agreement which marked the political end of the conflict. The international community again intervened and helped set up a transitional government (National Transitional Government of Liberia) which was led by Gyude Bryant until the Liberian general election of 2005. For more than a year, over 9,000 census-takers combed the densely forested nation mapping every structure. For three days starting 21 March 2008, they revisited each dwelling and counted the inhabitants. The president is elected by popular vote for a six-year term (renewable). The cabinet is appointed by the president and confirmed by the Senate. For other political parties, see List of political parties in Liberia. An overview on elections and election results is included in Elections in Liberia. In January 2010, Sirleaf announced that she would run for a second term in office in the 2011 presidential election while speaking to a joint session of the Legislature. Opposition leaders noted that in doing so, she had broken a promise made during her 2005 campaign to only serve one term if elected. Sirleaf garnered 43.9% of the vote in the first round, more than any other candidate but short of the 50% needed to avoid a run-off. Tubman came in second with 32.7%, pitting him against Sirleaf in the second round. Tubman called for a boycott of the run-off, claiming that the results of the first round had been fraudulent. Sirleaf denied the allegations, and international observers reported that the first round election had been free, fair and transparent. As a result of the boycott, Sirleaf won the second round with 90.7% of the vote, though voter turnout significantly declined from the first round. There is a Supreme Court, criminal courts, and appeals court and magistrate courts in the counties. There also are traditional courts and lay courts in the counties. Trial by ordeal is practiced in various parts of Liberia. The basic unit of local government is the town chief. There are clan chiefs, paramount chiefs, and district commissioners. The counties are governed by superintendents appointed by the President. There are fifteen counties in Liberia. ^ solutions, EIU digital. "Democracy Index 2018 - The Economist Intelligence Unit". www.eiu.com. Retrieved 2017-12-01. ^ Junger, Sebastian (October 2003). "Liberia's Savage Harvest". Vanity Fair. 9 (518): 276–286. ^ "Liberia President Ellen Johnson-Sirleaf to stand again". BBC News. 26 January 2010. Retrieved 21 September 2010. ^ Keating, Joshua E. (19 August 2011). "The Men Who Would Be Queen". Foreign Policy. Retrieved 21 August 2011. ^ "Sirleaf urges Liberians to vote despite Tubman boycott". BBC News. 5 November 2011. Retrieved 22 November 2011. ^ "Liberia election: Tubman to boycott run-off". BBC News. 4 November 2011. Retrieved 4 November 2011. ^ "Polls open for Liberian run-off vote". Global Post. 8 November 2011. Retrieved 22 November 2011. ^ "Liberia's Sirleaf appoints nun to probe poll violence". Yahoo! News. AFP. 15 November 2011. Retrieved 22 November 2011. Clower, Robert W. "Growth without development. An economic survey of Liberia." (1966). Ellis, Stephen. The Mask of Anarchy updated edition: The destruction of Liberia and the religious dimension of an African civil war. NYU Press, 2007. Fraenkel, Merran. Tribe and class in Monrovia. publ. for the International African Institute by the Oxford Univ. Press, 1970. Gifford, Paul. Christianity and politics in Doe's Liberia. Vol. 2. Cambridge University Press, 2002. Levitt, Jeremy Isaac. "The evolution of deadly conflict in Liberia: From paternaltarianism to state collapse." PhD diss., University of Cambridge, 2002. Book form 2005. Martin Lowenkopf, Politics in Liberia: The Conservative Road to Development, 1976. Amos Sawyer, The emergence of autocracy in Liberia: Tragedy and challenge. ICS Press, 1992. Amos Sawyer, Effective immediately, dictatorship in Liberia, 1980-1986: a personal perspective. No. 5. Liberia Working Group, 1987. William Reno, Reinvention of an African Patrimonial State: Charles Taylor's Liberia, Third World Quarterly, Vol. 16, No. 1 (Mar., 1995), pp. 109–120 Published by Taylor & Francis, Ltd. This page was last edited on 7 April 2019, at 03:37 (UTC).